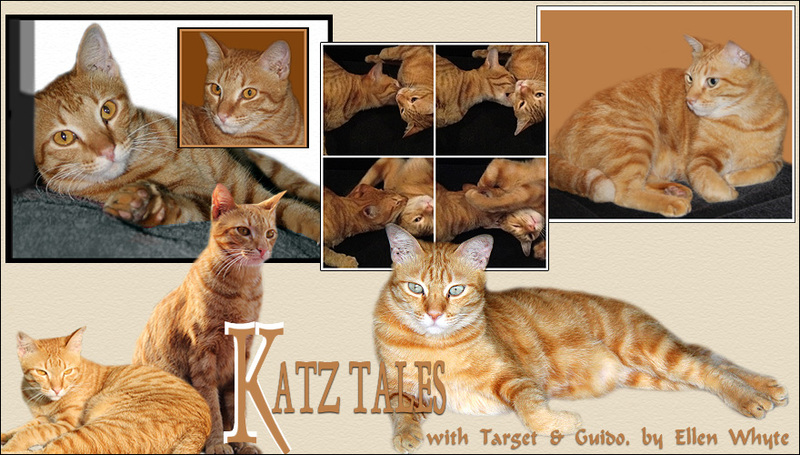 Katz And Other Tales: Au Speaks Out: It's ANIMAL DAY!!! We are going to celebrate too, but I didn't know the humans had to do whatever we wanted...YAY! We are gonna do what we usually do, only MORE and LOUDER! And nap. I think I'll do what the Katnip Lounge suggests! Oh dear, EJ didn't know about this. Well, the kitties had treats day before yesterday. Oooh I am scared! You are going to put de bitey on the feemal survunt! I must warn her of your 'gift' to her for World Animal Day! I am bizzy with my gaggle of volunteers making fings for World Animal Day. Wot fings? Nice fings! Animal fings. We are going to make sure all hoomans do nice fings for animals today and for the rest of their lives. My Rowdies are getting Fancy Feast Royale for dinner tonight and Amber and Chocky will get Natural Balance lamb sosidges. You like sosidges, Au and Target? I shall demand more cuddles by waking my parentals up extra early with headbutts, purrrs and neck cuddles. I think a whole hour of cuddles before work is a great start to animal day! Oh wow, this is a wonderful day! Happy Animal Day to you! I had extra chicken for dinner! We didn't know it was Animal Day. We will tell our mum right away so she knows she has to pander to our every whim. We didn't know it was a special day for us - Mum you've got to spoil us rotten today and give us extra lovies and treats. You guys are just too cute!!! We will ask for extra brushing and maybe if we are extra good boys there might be an extra meal. Most of all we will say our purrayers for an end to animal abuse and wish for loving homes for all the feral cats and dogs. Happy Day for us,I think we are all adorable and we deserve lots of cuddles and good treats! We're going to celebrate too and ask for extra treats and snuggling! Happy Animal Day! We had lamb today....fresh succulent yummy lamb! purrrrfect day...meow! Happy Animal Day - we try to make that day every day!